The classic, affordable spot is opening up in the Olam Signs location now that the former business has moved over to Broadway. 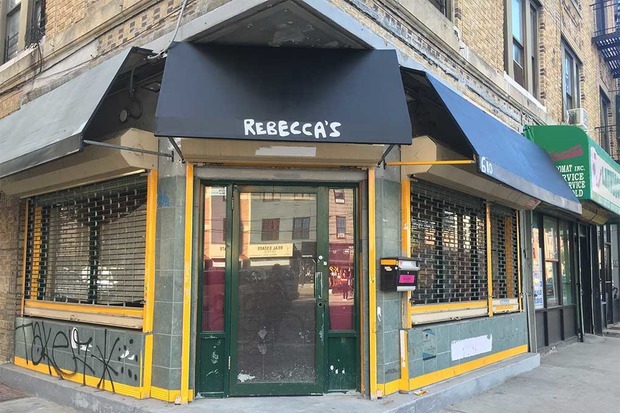 A comfortable new watering hole called Rebecca's will open for business on Friday at Bushwick Avenue and Jefferson Street when the bar throws itself a party, which will be complete with free pizza and $1 beers. Rebecca's is the collaborative creation of Norbert's Pizza kingpin Adam and his partner, Rebecca, whose B.A in architecture informs the space's cohesive and warmly simple aesthetic. The space is small—it comfortably hosts a few dozen patrons—but the open interior space, which is illuminated by globe lights that change color, feels much bigger. Some cheery neon signs hang behind the bar, and a vertical corner sign above the doors that was left in place by the previous occupants will soon be lit up with the bar's name. The place also feels very much like a labor of love. Hanging plants will soon frame the window; some of the furniture are curb finds that were carried back on the subway by Adam and Rebecca. The duo started preparing the space after Olam Printing, the business that had operated out of 610 Bushwick Avenue for about five years, moved to a more spacious location on Broadway— but even before the bar is officially open for business, it's a neighborhood establishment. Adam lives a few minutes away and was delighted to find a small, manageable place so close to home, and on a recent afternoon, neighbors from across the street dropped in to say hello and check out the most recent updates in the bar. Staff for the new spot also work at Flowers for All Occasions, and on the other side of Bushwick Avenue at Silent Barn. Visitors to Rebecca's can expect to find beers in the $2-$6 price range (Adam is excited to offer bright yellow Pacifico tallboys), as well as some specialty cocktails starting around $5. The all-vegetarian food menu is still in the works, but current plans include several plates, such as a hummus plate and a cheese plate, with the eventual possible addition of sandwiches and other items. Once the operation is up and running smoothly, events there may include screenings, dance parties and some art shows. Stop by on Friday and say hello! A neighborhood bar for fans of Norbert's. 610 Bushwick Avenue at Jefferson Street, off of the Myrtle Ave-Broadway stop on the J, M and Z trains.